In the weeks leading up to Halloween, we are inundated with Halloween candy everywhere we turn — the grocery, the pharmacy and on your co-workers desk. This year, instead of snatching a bag of mixed fun-size bars on your way to the cash register, why not try making homemade Halloween candy? Making imitations of your favorite Halloween treats is much easier than you might expect. We have chosen two of our favorites to share with you today! 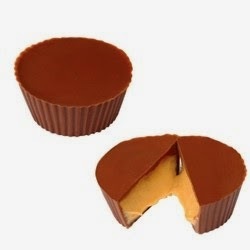 People have been enjoying Reese’s cups for almost 100 years! Using one of Sweet Treat Supply’s , melt some chocolate, and pour a small layer into the bottom of the mold cups to start making this delicious treat. Next, mix peanut butter with small amounts of butter and confectioner’s sugar. Although we know that a lot of you love natural peanut butter, you’re better off reaching for that jar of Skippy, as the oils in natural peanut butters will separate from the mixture and ruin your delicious center. Place a small spoonful of the peanut butter mixture in the mold, and cover with more melted chocolate. Be sure to keep these in the fridge so that they will maintain their nice snap! For the bottom layer of chocolate, melt 1 ¼ cups of milk chocolate chips and ¼ cups of peanut butter in the microwave. Spread over the greased baking sheet and put in the fridge until it is completely hardened. Next you are going to make the nougat layer. Melt ¼ unsalted butter over medium heat. Stir in 1 cup of granulated sugar and ¼ of evaporated milk until dissolved, and bring to a boil. Cook for five minutes, stirring occasionally. Mix in 1 ½ cups marshmallow fluff, ¼ cups of peanut butter and 1 tsp of vanilla extract, stirring until smooth. Turn off the heat and drop in 1 ¼ cups of roughly chopped salted peanuts. For the caramel layer, combine a 14 oz bag of caramels and ¼ cups of whipping cream in a saucepan over low heat. Slowly stir until smooth, and pour over the nougat and let cool. Repeat Step 2 for the top layer of chocolate. Let cool in the fridge for an hour before cutting into small rectangles and serving. If you want to give them out individually, try wrapping them in some of our Foil Candy Wrappers. Have you ever tried making your own candy bars at home? Was it hard to resist eating the ingredients before actually cooking them? Or, do you have any other homemade versions of your favorite treats that you would like us to teach you how to make? Let us know in the comments!